The Electronics systems and components industry is witnessing a major trend of outsourcing these days. Original Equipment Manufacturers (OEMs) are increasingly moving product design and development processes to Electronic Manufacturing Service (EMS) partners. They are either outsourcing the entire manufacturing or working under joint design manufacturing. Moreover rising application of electronics systems & components smart grid is expected to push new innovations in the industry. 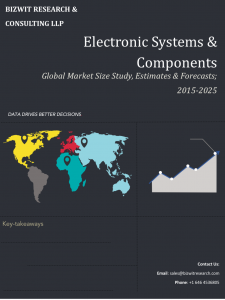 Some of our latest electronics systems and components reports include Global RF Component Market, Global Ultra Capacitor Market, and DC Motor Control Device Market. Pressure Switch Market Size Study, by Type, (Electromechanical and Solid-state) by Pressure Range (below 100 bar, 100–400 bar, and above 400 bar), by Application (HVAC, monitoring & control, safety & alarm systems, and hydraulics & pneumatics), by End User (Automotive & Transportation, process & Manufacturing industry, and Commercial) and by Region - Global Forecast 2017- 2025. Global Circuit breaker & fuse Market valued at approximately USD 6.62 billion in 2016 is anticipated to grow with a healthy growth rate of more than 5.00% over the forecast period 2017-2025.